Uptrend: Widen the distance of the lower band from the average. Downtrend: Widen the distance of the upper band from the average. The greater width of one of the bands from the center moving average separates corrective moves from real reversals. This move can become labor intensive, not least because before you can widen either band, you must be sure of the trend direction. In this figure, the price makes a bottom on the left side and starts an up move. The centerline is a moving average of the median price, or the average of the high, low, and close. The bands are formed by taking a moving average of the ATR and adding and subtracting it from the moving average. This process creates an ATR test that a breakout has to pass to qualify as a true breakout. 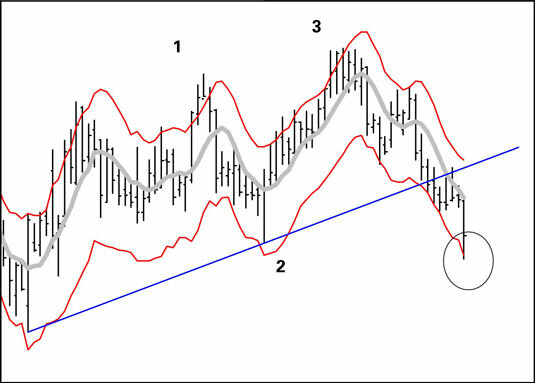 When the price starts a new uptrend, the price breaking the upper band confirms that you have identified the trend correctly. A downside breakout has to pass a bigger test in an uptrend. Accordingly, you widen the lower band by adding a percentage of the ATR to it. On the chart in the preceding figure, the lower band is 50-percent wider than the upper band (it’s 150 percent of the ATR). The last bar on the chart breaks the band, just after the support line is broken. This is no mere retracement! You have a double breakout of the trend (support) plus a volatility breakout (ATR band). A breakout above the upper band signals continuation, but because breakouts are a sign of abnormally high volatility, you can usually count on a pullback to the median.